Product #16211 | SKU ELM-MF | 0.0 (no ratings yet) Thanks for your rating! 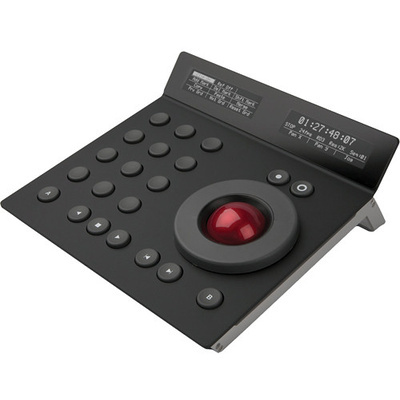 The Tangent Devices Element Mf Panel is the "Multifunction" panel of a set of four Element panels that replace a keyboard and mouse in operating select functions of supporting software, such as of supporting colour-grading software. The panels can be used to achieve precise results quicker and with more technical gratification than possible with a keyboard and mouse. The list of supporting software is a growing one and includes such applications as DaVinci Resolve, SCRATCH, On-Set Dailies, Mistika, and YoYo. Upon a control's being programmed, its functionality gets labelled on the display screen of its panel. When reprogrammed, its functionality gets re-labelled. The display screens have white OLED bulbs and show crisp, high-contrast, high-resolution easy-to-read characters. The Mf panel has two display screens and twelve programmable buttons. It has one programmable trackerball and one programmable ring atop the ball. It has separate reset buttons for the ball and the ring, two buttons to programme functions like ALT and Shift into, and standard transport buttons such as "play" and "stop". The trackerball and ring work by optical laser pickup for high-precision and extended life. The trackerballs can be removed for cleaning, and they can be reinstalled quite easily.